Dermatologists estimate that about 90% of women encounter cellulite at some point during their lives. Each case’s severity depends on a variety of factors including physical activity, diet, and genetics. With such a large portion of women dealing with cellulite, the demand for a healthy, safe and pleasant treatment has become skyrocketed. One of the most popular treatment methods is Endermologie. So, what is Endermologie? Learn more about the process that women are turning to with these common questions. Louis-Paul Guitay first developed the Endermologie process in the 1980s when he was searching for a way to treat burns and loosen patient’s scar tissue. After these first treatments, he discovered the process reduced the appearance of cellulite, improving the overall texture of the skin. Since this discovery, Endermologie has become popular among the beauty industry as a safe and verified way to temporarily reduce the prominence of cellulite. The Endermologie process is relaxing and non-invasive. This non-surgical method is generally offered at spas and is performed by professional aestheticians. During your appointment, you will be asked to wear a specially designed bodysuit to deliver the treatment’s full effects. A beauty professional will then pass the massagers along the cellulite or any specified problem areas. The massagers work to tone the skin and break down the lumpy material that causes the appearance of cellulite. Generally, appointments last between 30 and 45 minutes. Results can vary after your first Endermologie treatment, and the best results develop with repeated sessions. 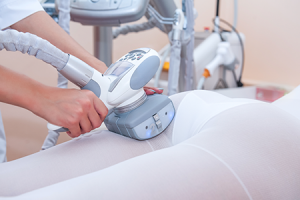 Endermologie sessions not only temporarily reduce the appearance of cellulite, but also improve local blood circulation, and relieve DOMS (delayed onset muscle soreness). Appointments leave you relaxed and confident in your appearance. Many women swear by the age-defying effects of this tried-and-true process and continue to see amazing results in their skin’s appearance. We recommend on-going Endermologie treatments to maintain the smoother appearance of cellulite and maximize your results. In addition to treatments, physical activity and a balanced diet also can affect your skin’s appearance. Discuss any drastic changes to your diet and physical activity with a professional first. If you’re ready to begin your Endermologie treatments and wave “goodbye” to cellulite, schedule an appointment with Dallas Endermologie! Our professional aestheticians will provide you with a relaxing session and leave you feeling refreshed and confident in your own skin. Call us today at 214-823-6666 or visit our website to book your Endermologie appointment.